Buh-bye, boring siding! A new trend may be starting to hatch. Small, portable homes in bright lollipop shades are seemingly everywhere lately — Think this vibrant fad will stick? We're crossing our fingers. Here are nine candy-colored head turners that are almost too adorable. 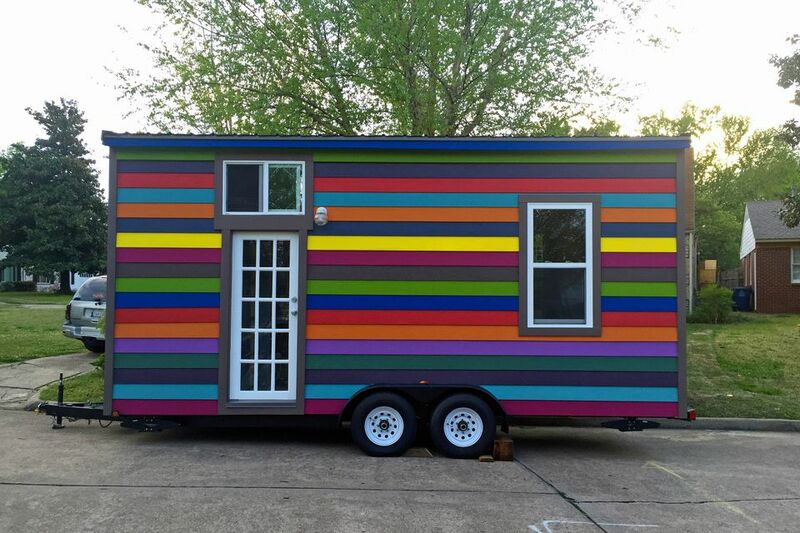 If you ever wished to live in a rainbow, this tiny house built by Taylor Painter-Wolfe might be the next best thing. She bought the building plans from Tumbleweed Houses and later made her groovy dwelling in her parent's driveway. How did she personalize her abode's exterior? She painted strips of wood siding in bold Kodachrome inspired colors before installing. Wolfe presently shares her portable home with her dog and cat. You can follow their tiny house adventures on Instagram. The Yosemite by Valley View Tiny House Company is an eye-popping charmer. But don't think this tiny home is just cute. Inside you'll find 180 square feet of living space with room maximizing features including a built-in Murphy bed in the main living area. Furthermore, there's a loft that adds an extra 40 square feet for storage or sleeping. The price for the professionally built home starts $37,500. Things that cost extra are environmentally friendly upgrades like a compost toilet or energy saving appliances like a ventless, washer dryer combo. Looking to make something from scratch? You can order the printed building plans as is for $299 or you can have Valley View customized them to suit your needs for roughly $200. This happy, hued house on wheels aptly named, The Toy Box Home, is made from environmentally friendly building materials. The playful home packs a bright 140 square foot interior that's tricked out with double duty features that make small space living efficient and comfortable, like a cube-style sofa that conceals abundant storage. Perched above the main living area is a sleeping loft, which adds an extra 42 square feet — yep, that's enough room for a king-sized bed. Hate seeing electrical cords — don't we all? Throughout the abode are hidden outlets and built-in LED lighting that conceal unsightly wires. If this cozy home stole your heart, you could buy one for around $60,000. Say hello to France, a prefab home with a certain je ne sais quoi. It was designed to snap together like a jigsaw puzzle in less than three hours. What else makes this pint-sized dwelling ah-mazing? Behind its shed-like exterior is a surprisingly modern living space. Behold some mind-blowing photos. And here's the frosting on the cake (or should we say glaze on the French pastry?) The prototype cost only $1,200 to make. It's the latest design by Joshua Woodsman. He's the small space architect behind Pin-Up Houses. We'll like you know when this prefab goes into production. Grab your tambourine — this gypsy caravan will channel your inner Stevie Nicks. Inspired by the horse-drawn wagon homes used by nomads in Britain during the Victorian era, campers like this one are equipped with a few home amenities like a small sink and compact fridge, but they're too itty-bitty to accommodate a full bathroom or working kitchen. The best ones for year round glamping are insulated and of course roadworthy. The Poco, by Mint Tiny House Company, is a cotton candy pink dwelling that's cuter than a button. Behind the adorable and practical glass doors is a fully outfitted kitchen and bathroom, and of course, a cozy living area that just might inspire you to downsize stat. Take a home tour. Home much does this cheerful home cost? Prices start at $31,000. Moreover, the builder offers a ​delivery service for an extra charge. What inspired this tiny house's fearless paint job? The gingerbread trim. It's an old-timey feature borrowed from Victorian-era homes, which were often painted in bold contrasting colors, including pink and purple, to show off the exterior molding. Who owns this sweet purple abode? Nicki Jo Davis, a brave lady firefighter. The tiny home is called the Ravenlore, and it was a custom built by Tiny Green Cabins. One thing is for sure, building a tiny house isn't easy. That's why the folks at Jamaica Cottage created a line of prefab kits that goof proofs the process for semiskilled DIYers. A favorite is the playful Apple Blossom Cottage. It's available as a four season, turn key home for less than $60,000, and as a fully assembled shell for less than $14,000. On the fence? You can test drive this micro dwelling. Cardboard is now more durable than ever. Since it's relatively easy and cheap to mass produce, many innovators have developed new fabricating methods to boost the humble material's resilience. That's why soon you might be able to buy a prefab tiny house made of cardboard like this one called Nido House, by Italian architect Francesca Fadalti. While this micro dwelling is still in the development phase, Fadalti plans to make the flat packed home available online in three different sizes: 172 square feet, 210 square feet, and 250 square feet. But here's what makes his idea super exciting. Customers will be able to customize their cardboard homes inside and out with colorful patterns. Learn how you can spend a night or two in Nido House.